Swanson Astragalus is a dietary supplement containing 470 mg of powdered root of Astragalus in one capsule. Astragalus membranaceus is a plant of Traditional Chinese Medicine, it belongs to the pea family and is characterized with feathered leaves and colorful flowers. It has been mainly used because of its anti-inflammatory and adaptogen properties. Traditionally it has also been used with the hope of prolonging life. Polysaccharides contained in this miraculous plant mainly influence the immune system. They affect the stimulation of pro-inflammatory cytokines production (TNF-α, GM-CSF, nitric oxide) by macrophages, however, only when the need arises. Therefore, it doesn’t intensify the general inflammation, which in the long run is harmful. Astragalus is characterized not with the stimulating effect on the immune system, but with the effect modulating proportions between pro- and anti-inflammatory factors, thanks to which we achieve maximum benefits without the risk of intensifying chronic inflammations. One of the more interesting functions of Astragalus is its cardioprotective effect. It influences astragaloside IV, one of its active substances. It is speculated that astragaloside has a protective effect during ischemia and improves coronary blood flow thanks to the enzyme of nitric oxide synthase. Thanks to the pathway NO – cGMP in endothelium, astragaloside IV also demonstrates relaxing effect and increases the lumen of aorta and other arteries. It may also partially decrease the negative influence of homocysteine on the circulatory system and the probability of developing its diseases, thanks to antioxidant effect and maintaining positive effect of acetylcholine, which is blocked by homocysteine. It is also speculated that it has the influence on erythropoiesis intensification, thanks to flavonoids contained in Astragalus (Calycosin-7-O-β-d-glucoside). Research shows that Astragalus may potentially protect kidneys against damages in various ailments, e.g. lupus or diabetes. Among others, it stems from inhibiting NF-kB factor by polysaccharides in kidney tissue. Downregulation of TGF-b has also be noticed, which is a biomarker of kidney inflammations. Diuretic effect of Astragalus will be interesting especially to those who complain about excessive water retention under skin. It is a problem that most often concerns women, especially in certain phases of menstrual cycle. The mechanism lying at the base of the diuretic effect is strengthening the effectiveness of atrial natriuretic peptide (ANP). This factor inhibits resorption of sodium ions and water in cumulative tubules of kidneys and consequently it causes the increase of excretion with urine. Astragalus is classified to adaptogenic plants, which means that it demonstrates the properties modulating the organism’s reaction to stress. In practice it allows us to better cope with the situations in which we earlier reacted excessively, which means more stable mood during the day and limiting upsetting consequences of increased exposure to stress and cortisol. Regulating cortisol concertation may be reflected in better well-being, energy growth and normalizing daily rhythm, thanks to which better sleep is possible and getting up with proper motivation to take daily actions. In old days it was believed that taking Astragalus could ensure people longevity. It is hard to find the explicit confirmation of this thesis, however we may find a few effects that decidedly are conducive to prolonging life indirectly. One of the factors is neuroprotection, i.e. the ability to protect nervous system cells against damages, especially those progressing with age. Protective effect on mitochondria may also translate into longer life. A positive influence of telomeres has also been noticed. These are the fragments of chromosomes located at their ends, which secure them from damage during copying. Each cell division is related to telomere shortening and this is related to general aging of the organism. Telomeres protection may also potentially slow down aging processes. 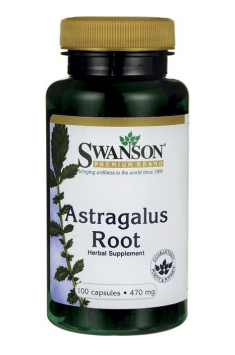 Swanson Astragalus is recommended to people who want to naturally support general health with special emphasis on the work of the immune system, cardiovascular system and kidneys. It may be also helpful for stressed people, who would like to improve their quality of life and adequately reduce stress reactions to negative stimuli. Astragalus Root 470mg 100 caps. As health prophylaxis one capsule a day seems to be sufficient, however, if we need stronger support of our organism, it is worth doubling the daily dose. Optimal effects will be caused by regular use, preferably for at least 4 weeks. The best time to use the supplement with Astragalus is fall, because of the increased risk of infections. Gelatin, microcrystalline cellulose (plant fiber).